DETAILS: 47 Royal Fern Way has that classic WaterColor charm. It is located on a wooded lot with lots of mature trees backing up to the beautiful cypress cove landscape. This is a nice relaxing setting for you and your family to enjoy your vacation! 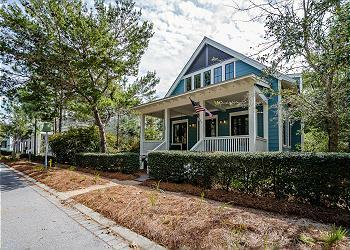 This amazing 3 bedroom, 3.5 bathroom vacation home in the Forest District of WaterColor is sure to please. With its well-appointed furnishings and ample space throughout, it will make any vacation a retreat. The first floor is where you will find a spacious master bedroom with a king size bed in neutral tones. It has a connecting master bathroom, with double vanities, a large soaker tub and a separate shower with detailed tile work. On the second floor, you will find two more cozy bedrooms, each with queen sized beds decorated in neutral tons with pops of color. With each of these bedrooms, comes a complete connecting bathroom for your vacationing comfort. This will ensure a relaxing getaway. There is also a day bed with a trundle bed on the second floor for the kids! This is a bright area with all of the comforts you would expect. This home also boasts a spacious living room with a flat screen television and elegant furnishings such as the couch with a pullout sleeper sofa, love seat and rug that all exude the WaterColor life-style.You will enjoy cooking family meals in the kitchen area. There, you will experience the high end appliances with a wine cooler, granite counter tops and stunning cabinetry. There are also bar stools along the kitchen island, which is sure to be a crowd pleaser. This kitchen floor plan flows beautifully between the dining room and the living space so that everyone is able to enjoy their time together. A large dining room table with two chairs and two long benches adds the final touches to an already outstanding eating area. This home also has tremendous outdoor living areas for you to be able to relax on one of the three outdoor covered porches. This will certainly provide enough room for everyone to spend time together. We had a great time in Watercolor this year. The house was very comfy - definitely felt more like a home than just a rental - and perfect for our group of 5. Thanks 360 Blue and 47 Royal Fern Way for a memorable trip! We are so glad that you enjoyed your stay with us in Watercolor! Thank you for your kind words and for staying with 360 Blue! We hope to host you all again soon!